"Newtown Township Municipal Office Complex"
Construction of a master suite in an 18th century home. Turning an existing bedroom into a master bath and closet area. Constructed wall and frame work for a pocket door, retro fitting an existing unused door to fit. The GALLEY Enterprises twist, installing transom windows with back lighting. 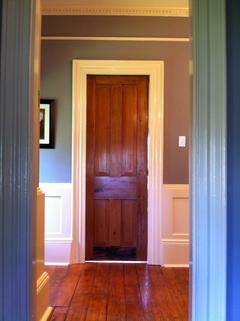 Repurposed and created wainscotting using old doors, installed crown molding and door and base trim. Installed recessed lighting, exhaust fan and ducting. Closed off the original entrance to the room and constructed and framed out for a 42x42 mabble tile shower. Installed Hardybacker cement board with vapor and water barrier. Installed and grouted 2in x 2in marble tile throughout wall and ceiling areas with a heavy duty acrylic pan. Installed vanity, mirror and lighting. The toilet had to be leveled as the floor was 3/4 inch out of level, see pictures. Constructed a corner closet with shelving and created wainscotting from doors. In the bedroom area we removed an existing closet expanding the overall room area. Primed and painted all. In teh victorian bedroom we created and installed a large scale crown moulding and finished in high gloss oil. Repaired the ceilings and walls and skim coated and painted. All existing trim was painted in high gloss oil. The fireplace, which was decrative to the house was modified and a faux texture was created to give the fireplace more character. "Coney Joe's" restaurant, Morrisville Shopping Center. Demolished an existing room and constructed two bathrooms and a partition wall 10' along centerline and 4' knee wall for bain-marie and counter area, perimeter wall installation all steel stud construction. All electrical conections, plumbing and counter space. Installed acoustical ceiling grid system and panels. Installed drywall 10' sheets, taped and spackled all walls, primed and painted. The steel exhaust hood was installed by the manufacturer . Installed solid core steel frame doors and hardware. Sheet plastic (FRP) installed in wet areas and baths, etc. The floor was shot blasted by a company that specializes in preparing heavy glued concrete surfaces. After the surface was clean we made repairs to the concrete were several cracks were revealed. We then skim coated areas and leveled various areas to make level and created a cove base to which the flooring runs up the wall about 4 " (a great cleaning feature for the restaurant) We then applied the CTI flake floor system with a two part urethane finish which never needs to be re-sealed. Newtown Township - Administrative, Business, Finance, Manager offices and related areas. - Newtown Township - Police station offices, holding cells, and related areas.